Hey Girl is an AMHA/AMHR red roan sabino miniature mare. 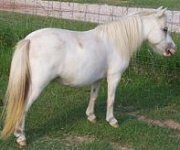 She is 33" tall and has gained alot of roaning, snowflakes, and mottling since she was a foal. Owned by Lauralees Minatures. Photo kindly provided by Laura Harber.